Mixology Monday! After missing the second post in August (thanks, Las Vegas, but I forgive you because of the Vesper), I’m back and ready to mix! As usual, take a look at the MxMo site if you’re not familiar with the monthly gathering. The host this time ’round is Lindsay over at Alcohol Alchemy. The theme? “Local Color,” highlighting locally-made spirits. Take a glance at her announcement post for all the necessary info, and be sure to check out the roundup post. Here in Georgia, local liquor has been a long time coming, and a long time gone (the officially-produced stuff, anyway…moonshine has quite a history of its own in the South). With the surge of interest in microdistillation in the past few years, a few craft stills have finally started up, though most are still navigating the maze of legal paperwork necessary for them to begin making and selling their spirits. The outlook in Georgia is promising, however. Shawn Haul and Bill Mauldin, owners of the Georgia Distilling Company, aim to make a peach brandy (let’s hope it’s a true aged brandy…not just a liqueur!) and corn whiskey. Tallulah Falls Distillery is, from what I can tell, waiting for its still to arrive and its permits to go through, laying plans to make whiskey and possibly an apple brandy. Back Of The House, in Columbus, is also waiting for permits and planning to produce rum from Georgia sugar cane, while Dan Rivers, of Butts County, has yet another corn whiskey in the works and a brand new building in Jackson. Vennebroeck Velvet Distillery is supposedly working on a small-batch rum way out in Richland, and is one of the few distilleries that is listed in the American Distilling Institute’s Directory. Finally, Cheryl Wood and Dwight Bearden want to make moonshine at Dawsonville City Hall; not surprising, considering its the home of the annual Moonshine Festival. For now, we really only have 13th Colony Distillery down in Americus. 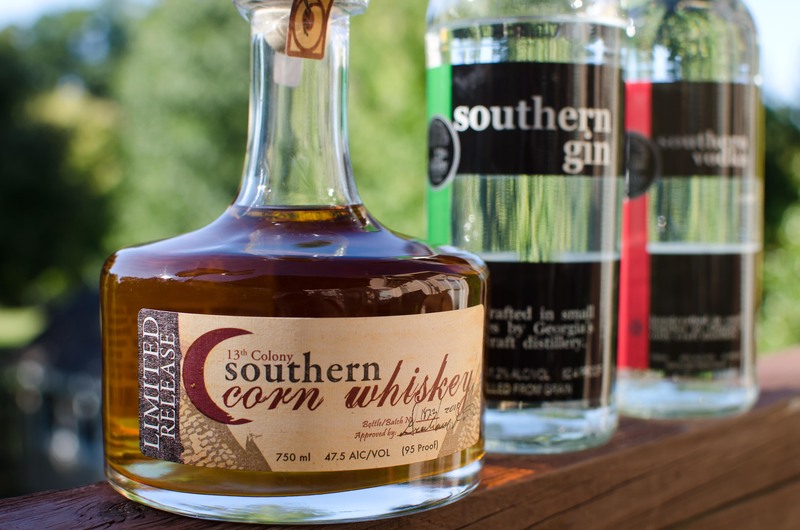 In operation since 2009, 13th Colony is the first distillery in the state since Prohibition, and currently produces Southern Gin, Southern Vodka, Plantation Vodka, and an aged Southern Corn Whiskey. A bourbon is supposedly in the works, but no word of a release date (yet!). The distillery itself comes from humble beginnings: the four owners started making moonshine as a Christmas gift for co-workers and employees, and the operation ballooned from there, though not after a warning from the local sherriff. Thus began a two-year permitting and licensing process, which has, fortunately, placed 13th Colony bottles on select shelves around the southeast. For a bit more on 13th Colony, check out the “News” section on their website, and definitely look at the article on them by fellow southern blogger Brad Kaplan on his site, Thirsty South. Stir with ice and strain into a chilled cocktail glass. Garnish with a lemon twist made over the drink. Following on the heels of the Fightin’ Words and the Last Word, I wanted to maintain the sweet/herbal quality of the drink, giving it some sugary “bite” to match the new oak and corn of the whiskey. After some failed experiments with Bénédictine, Cherry Heering, honey liqueur, and maraschino liqueur, I settled on ginger liqueur — it had the exact kind of edge I was looking for and whiskey and ginger make a natural combination. 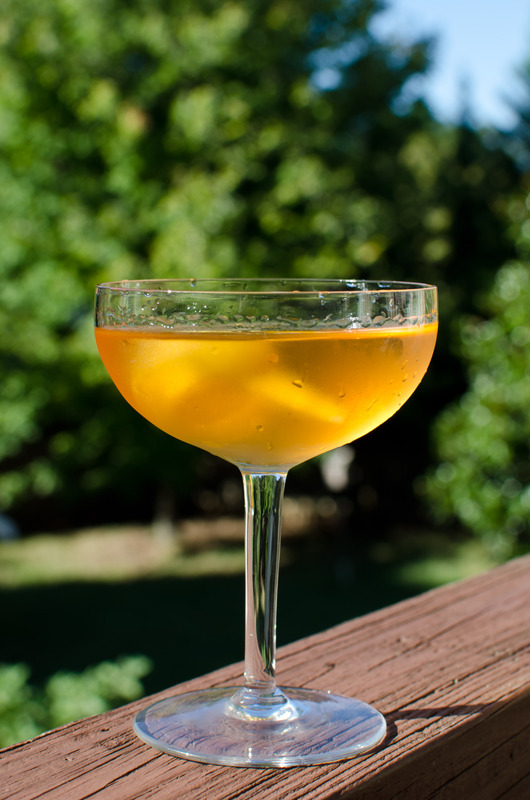 The Domaine de Canton is not overly strong, flavor-wise, but that works to its advantage in this drink. To add more “depth” I dashed in the whiskey-barrel-aged bitters, rounding out the cocktail a bit and upping the complexity, bridging the gap between the liqueur and the whiskey. The oils of the lemon twist top it all off with some citrus that just begs to be added, but not in juice form (I played with this in earlier iterations, and it resulted in a watery, sour drink that would take too much sugar to even out). Nothing excruciatingly complex, I know, but I’m happy with it… sometimes simplest is best. About 13th Colony’s other spirits: their Southern Gin is fairly lively and bright, and not particularly juniper forward. It also smells distinctly of carrots, or maybe celery, or coriander. I recommend it for brighter, lighter, citrusy gin drinks and in fizzes. 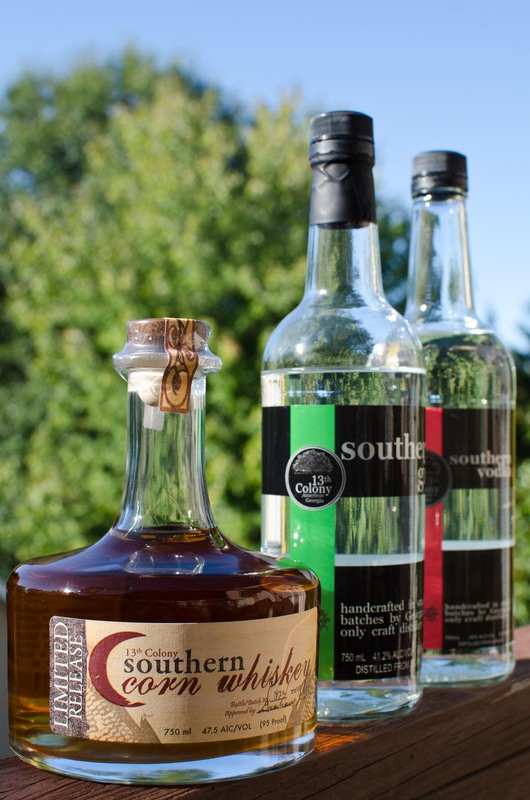 I don’t use vodka very often, but their Southern Vodka works very well for mixing, and won’t cost you an arm and a leg. Drink local! PS: For those of you living in or around Atlanta, I’ve found two places that regularly stock 13th Colony liquor: one is Pop’s Wine & Spirits, in the Duluth-Johns Creek-Suwanee area, and the other is Total Wine & More in Alpharetta (there wasn’t much of the corn whiskey left, last time I checked!). Tell your local store to get in touch with Empire Distirbutors if you’d like some sent to you. PPS: For more on the spirits scene in Georgia, you’ll have to turn to the Atlanta Journal-Constitution, which, along with a few tidbits on local distilleries, has thankfully been giving a lot of press to our burgeoning cocktail scene (I’m still amazed that Imbibe named us one of their top cocktail cities!). The local breweries and wineries receive frequent write-ups, as well. AJC: “From the backwoods to Main Street: little distilleries pop up in Georgia.” August 16, 2010. AJC: “Georgia distillers want law cleared up.” March 4, 2011. AJC: “Making the most of ‘moonshine. '” May 25, 2011. Check out the above links for some stories on microdistilling in GA.
That looks outstanding! Thank you so much for participating this month! 🙂 I especially love hearing the stories behind the liquors. What’s you’re best guess at a suitable substitute for the 13th Colony here? Hmm, that’s a tough one. I haven’t tried to match it to another whiskey. The East Meets West would probably work with any bourbon (or maybe a Tennessee whiskey) — just alter the amount of liqueur as appropriate to your taste buds. This entry was posted on September 24, 2011 by IJ Lauer in Domaine de Canton Ginger, Drink Recipe, Liqueurs, Mixology Monday, Spirits, Whiskey, Whiskey Barrel-Aged Bitters and tagged 13th colony, americus, cocktail, distillery, drink, east meets south, georgia, ginger liqueur, local color, microdistillery, mixology monday lxi, mxmo, recipe, southern corn whiskey, southern gin, southern vodka, spirits.